I saw Husker Du at Lisner in D.C. in Spring 1987. They basically did Warehouse: Songs and Stories (1987) in sequential order, with very few surprises. The show was a bit boring despite the fact that I ended up sneaking backstage with a friend of a friend who worked at Tower Records across the street. This guy was in The Meatmen but I don't think it was Tesco Vee. The band was cool and Greg Norton, Bob Mould, and Grant Hart were remarkably down to earth. I remember seeing the late WHFS DJ Tom Terrell there and that was about 6 months before I'd get to know Tom a tiny bit once I started working at the Record and Tape Exchange in College Park, Maryland. I didn't bother to see Husker Du at the 9:30 Club later that year 'cause I thought they'd be doing the exact same show. I missed out 'cause the band broke up very soon after that. 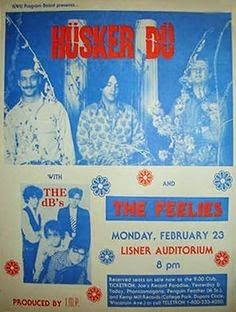 Someone dug up this poster on Facebook and it mentions The dB's as an opening act for Husker Du. My friend, the guy I went to the show with, was a HUGE dB's fan at the time, and he doesn't remember the band playing there, and a lot of people on Facebook don't remember anything about The dB's at the gig. So, someone please settle the mystery for me. Were The dB's there and if not, why not? UPDATE: So it appears, after digging around on some Husker Du websites, that the February gig was rescheduled for March 1987. So I am guessing that I saw them then. This might explain the absence of The dB's 'cause everyone I've talked to who remembers this gig does not remember The dB's. And I vaguely remember an opening act, but seeing as how I barely knew who The Feelies were in early 1987, it sort of makes sense that I can't remember much about them...if they were indeed the opening act at the rescheduled March 1987 gig. In the meantime, enjoy this studio outtake from the Warehouse: Songs and Stories (1987) sessions. It's a demo (?) version of one of the best songs on the record but it sounds a whole lot different here.